Draw a silly pumpkin face with pencil on an orange resin pumpkin. Paint the face with yellow indoor/outdoor acrylic paint. It may need 2 or 3 coats to cover evenly. Let dry. To create the curly vine, cut three 8 inch pieces of wire. Apply a small amount of craft glue to a few inches of the back of the floral tape. Continue to add glue to the back of the floral tape slightly overlapping the tape as you continue to wrap it around the wire. 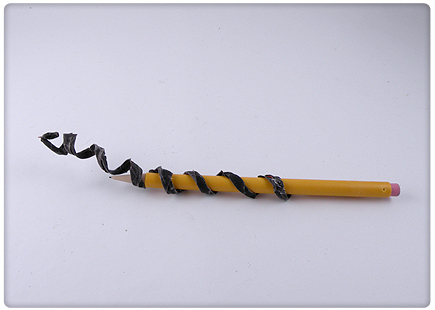 Wrap the covered wire around a pencil to put the curl in your vine and slide it off the pencil. Apply craft glue to the end of each of the curly vines and attach them to the top of the pumpkin. 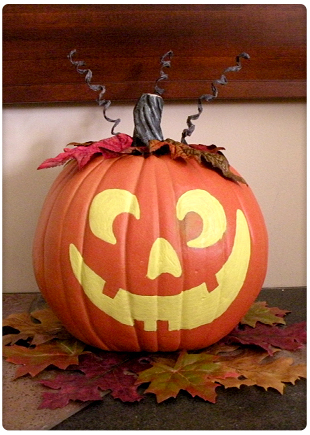 Apply glue to the wrong side of the leaves and place them evenly spaced to the top of the pumpkin.